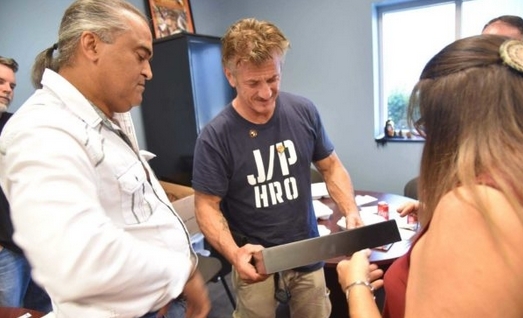 Sean Penn, the winner of two Oscars, stopped by the Lumbee Tribe of North Carolina, on Sunday to assist in the relief efforts in a region that has been hit hard from flooding, power outages in the aftermath of Hurricane Florence that hit both Carolinas hard over a week ago. 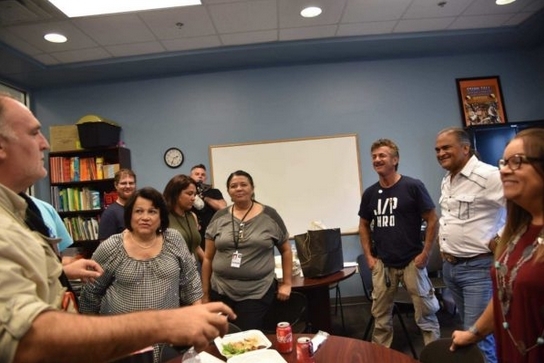 The Lumbee Tribe of North Carolina has collaborated with Chef Jose Andres’ organization World Central Kitchen, and Sean Penn’s organization J/P HRO to see to the needs of this community in the aftermath of Hurricane Florence. Chef Jose Andres and his staff along with J/P HRO have continued to deliver meals to our site for distribution and have assisted with our disaster relief efforts. On Sunday, Sean Penn and Chef Jose Andres met with Chairman Harvey Godwin, Jr. and Tribal Staff to discuss the ongoing relief efforts and the needs of our community going forward. Penn was able to be observe and visit with tribal staff and volunteers, as they worked to get supplies and meals distributed to our community members. 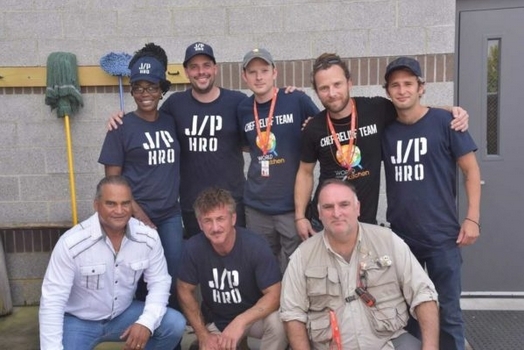 During his visit Sean Penn and J/P HRO wanted to ensure the focus was and remained on the relief efforts. Mr. Penn was extremely humble and sincere in his desire to help our community and the Lumbee Tribe is grateful for his concern and generosity. Chef Jose Andres’ organization, World Central Kitchen uses the expertise of its Chef Network to empower people to be part of the solution, with a focus on health, education, jobs and social enterprise. Sean Penn’s organization, J/P HRO has four core programs: Community Health, Community Development, Engineering and Construction, and Reforestation. J/P HRO’s mission is to save lives and build sustainable programs quickly and effectively with those impacted by disasters. The Lumee Tribe says due to the partnerships with these two organizations, the Tribe has been able to provide food and needed supplies throughout our tribal community in the storm’s aftermath and expresses its gratitude. Responses to "Actor Sean Penn Helps Lumbee Tribe in Aftermath of Hurricane Florence"